Fourteen years ago, Bill and Brenda Clark were ready for a change. Bill, a mechanic and part time fisherman came out to Isle au Haut to help a resident with a boat engine. He came back to Brenda with an idea. 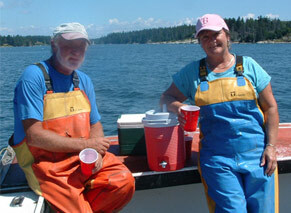 It took some time to arrange things on the mainland- selling Bill’s auto shop, selling the house, etc, but soon they had made the transition, and Bill was finding his way into the Isle au Haut fishing fleet as a full time lobsterman. After six years in the ICDC house, Bill and Brenda were able to purchase affordable land from the town, and build a house of their own.